Zack Greinke has a very respectable 10-3 record with the Arizona D’Backs this season. But he is also making a little news with his bat… and his legs. 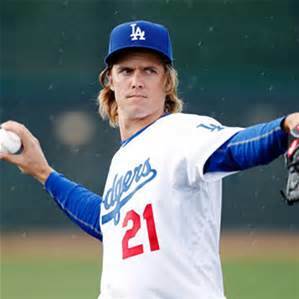 Greinke is looked upon as one of baseball’s best athletes among pitchers. He has been a threat with the bat; he is batting .270 this season with 10 hits, second most for pitchers. On June 23, he stole a base, his first of the season, in the D’Backs 7-6 win over Colorado. It was Greinke’s fifth career stolen base, making him one of only 84 pitchers to have stolen five or more career bases. Greinke has quite a ways to go to challenge the MLB record for most career steals by a pitcher. That mark belongs to Bill Donovan who had 34 steals in his career that lasted from 1901-18. Second on the list is Doc White with 32; he is another hurler who played in the early days of baseball… from 1901-13. If we look at pitchers from a more recent time, Greinke is one of 11 pitchers who has played since 1970 to steal five or more bases in a career. Here’s a look at the pitchers who played since 1970 and have the most career steals. The most stolen bases by a pitcher in a season since 1970 is four by Blue Moon Odom in 1972 when he played for the Oakland A’s. Tom Browning (1988 with Cincinnati) and Joaquin Andujar (1985 with St. Louis) each stole three bases to follow Odom. With his fifth career stolen base to go along with six career home runs, Greinke also became the 31st pitcher in MLB history to have five career steals and five career HRs. Only six pitchers have reached these numbers since 1960: Andujar, Gibson, Greinke, Kaat, Maddux and Odom. Gibson is one of four pitchers in history to have 10 career steals and 10 homers; he had 24 HRs and 13 steals. The others: Bucky Walters (23 HRs and 12 steals); Walter Johnson (24 HRs and 13 steals); and Harry Howell (10 HRs and 18 steals).